Similar advice for the first time half marathoners is aim to finish and enjoy the event. Don’t worry about your time. The following advice is from our sponsor FIX muscle performance. The Shepparton Runners club thanks Cher for her advice and offer. Just a little Fix Tip. Stretching we all do it but why? When you stretch, the muscle fiber is pulled out to its full-length sarcomere by sarcomere, and then the connective tissue takes up the remaining slack. When this occurs, it helps to realign any disorganized fibers in the direction of the tension. I am a big Fan of Stretching very gently and in a form of Range Of Motion rather than holding a stretch for 15 seconds. Range of motion so stretching your quads do it gently move into a stretch position for 3 seconds and move out of it then go again and hold for 5 seconds and do it 8 to 10 times holding for longer each time. Benefits of stretching this way is that you will not aggrevate your nervous system which if you do it reacts by making muscles shorten to protect the region that has been aggravated. Also Love Yoga after comps its a great way to stretch out your entire body. To all Shepp Runners Club Members Fix will shout you a free Yoga class this Tuesday morning at 6.15am. Class will go for an hour and all you have to do is call the clinic on 58315400 and book in. 10 Spots available so first in !!!! All the best to everyone competing !!!! For those that were at training, last Thursday Chris put us through some strength training. He mentioned that we could do them at home. If you want to look at a bigger range of strength training you can get more information from Expressions of Pye blog. Sarah Pye is a former SRC member now based in 1QLD continuing on with her triathlons. You can subscribe to her blog here Expressions of Pye. City2City in Albury. Danny Selva clocked 40:00 for 10 km . Congrats on a PB..
A cooler morning and 192 people enjoyed the views around the lake as they smashed out 5kms. It must have been a good morning for it with 39 PB’s recorded and lots of smiling faces. Thanks to all our Vollies this week for without you parkrun would not be what it is. Special thanks to Cadel Nicholson who volunteered at the last minute to be today’s fabulous photographer. Great work Chelsea Nicholson, Louise Secomb, Kate Dainton and Lydia Monk on a well deserved Parkrun PBs Feb 17. In about 1983 a former work colleague and I did Melbourne Marathon (Frankston to Melb art centre) 3:38:00 Yep I was fitter back then. I did take a few years break possibly to get over the marath0on, but then came back to running and the SRC in about 1990. I find running an easy sport for someone with not the greatest eye-hand coordination. I could do it at a level and I enjoyed it. 35 years with a few years off. What is a typical training week look like for you? Depends on what I am training for and the time of year due to work commitments. My heavy training is in the 3 months leading up to Melbourne marathon in October. I am for a long run on Sunday up to 30 km. Saturday is Parkrun plus 5 km During the week I like 1 morning session of 10 – 15 km and 2 speed sessions similar to what our Tuesday sessions are like. What are your running goals for the next 6 months? 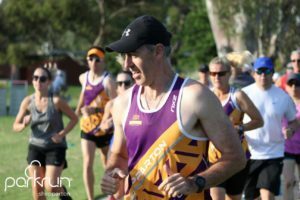 Wangaratta Half, Albury marathon (and that’s going to hurt). I would like to add Gold Coast and Melbourne marathon is locked in. I will also click over 200th Parkrun in March. What is your biggest challenge and what do you do to manage it. My biggest challenge is getting out of bed at 5:30 am to go for a run. It doesn’t matter if it’s hot or cold. I find running by myself harder in the morning. What do I do to manage this? I focus on motivation words and podcast that I have heard in the past. Where is your most enjoyable place to run? 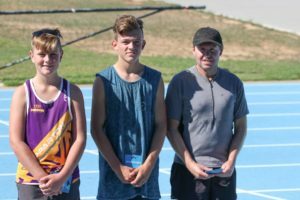 Parkrun helping others get Pbs. Running onto the MCG after Melbourne Marathon. Who inspires you (to run)? It’s more of a type of person that inspires me rather than an individual person so here are 4 inspirational athletes as an example. 1.Sue Olley, she has won her age group at the Canberra Marathon. She won the Mansfield to Buller 50 km untra marathon (women). As someone now on the other side of 60 she smashes out Parkrun times that 20 y.o. are envious of. She can also keep up with the pack in a 21 km training run. Also 2.Trevor Dainton with his I don’t care if it hurts attitude I’m still running. I can relate to that. It would be hard to find someone more mentally tougher than Trevor. Anyone that comes back from a major trauma to compete again inspires me. Albury based triathlete and friend, 3.Ange Ednie was knocked off her bike by a kangaroo. She was airlifted to The Royal Talbot Rehabilitation Centre in Kew where she spent 2 months to have spinal surgery along with facial surgery. She also needed to learn to walk again after not being able to move her arms or legs for the first week. . Given 9 months for a full recovery, it is now four months on and still with a long way to go Ange is back home cycling and swimming. Also on a famous level, you have 4.Turia Pitt who was caught in a fire while running a marathon. She received 65% burns to her body. Years later and scores of operations later Turia is competing in triathlons and road races while helping others through her business (SOC) School Of Champions. I know neither Ange or Turia needed their tragedy to be as motivated as they are.Their natural motivation is what got them through their own trauma. SRC would like to welcome Sportsman’s Warehouse (SW) as a sponsor of the club. SW has always donated prizes for the handicaps, but this year they are offering SRC members 10% off full-priced clothing and footwear. For us to make this happen, we are asking 2018 members to email their full name, email, phone number, postcode and if you are already a SW member to sheppartonrunnersclub@gmail.com so we can add you to the SW database. Albury/Wodonga’s first Yoga and Wellness festival is here. It is our very own version of Wanderlust with ALL proceeds going to the Cancer Council. Sarah Rogers is taking part in the 2018 Stars of the Border, as part of her fundraising efforts she dreamt to bring this great event to life, and with the support of our amazing community that dream has become possible. We are very excited to invite you to a day filled with yoga, meditation, wellness events, hands on workshops, and local musicians to entertain us. The speakers and events we have lined up are incredible. Buy tickets here – Yoga and Wellness festival. 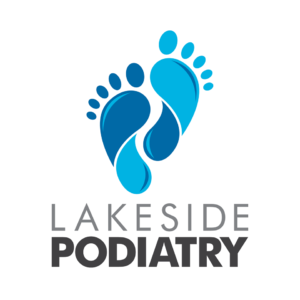 The word Podophobia originates from Greek ‘Podos’ meaning feet. People with Podophobia tend to get upset at the sight of feet. Different people experience Podophobiadifferently: some do not like it when others look at their feet or touch them. Still others are anxious or afraid of their own feet. Do you know someone afraid of feet? Kathy Fuller and Allan Connelly. Two of Shepparton’s Queens batonbearers. I really like to eat so with running I could eat without too much guilt!! ….. I had a work colleague complete the GC marathon and was talking about at work drinks when she said to me “you wouldn’t be able to do it”…..challenge accepted!! I really enjoy at Sunday long run…first thing in the morning…I love Parkrun in Saturday and am starting to enjoy interval training on Tuesdays…otherwise I just fit it in as I can! I would really love to do the half in under 2hours…. What is your biggest challenge and what do you do to manage that challenge? Have you had a breakthrough in your running, if so, what was it? At the Echuca race against the paddle steamer a couple of years ago I discovered I could maintain a sub 6min pace! I was stoked!! Up until then I didn’t think I could do that! If you could run in any event in the world, which event would it be? Who inspires you to run? 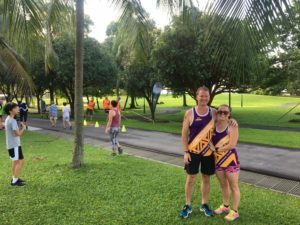 Sam and Tara in Singapore for Parkrun. On a quick trip to Singapore, Tara and I followed in the footsteps of Allan and Kerry, and ran the West Coast Park Parkrun. Blessed with a relative cool 24 degrees, the humidity still took its toll. Out of around 60 parkrunners, about 10 we’re international visitors. They were welcoming and friendly, as most parkruns are, and it was great to mark off our first international Parkrun. When entering make sure you enter under the team name of Shepparton Runners Club. 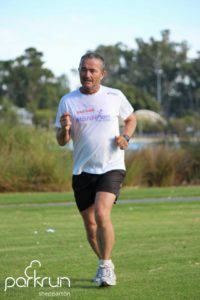 Over the second weekend in March, on an island midway between Victoria and mainland Tasmania, you will find one of the most unique running events in the country, the King Island Imperial 20. The event is now in its 25th year. The King Island Imperial 20 has an event for everyone. The main feature is a challenging 32 kilometre footrace which is the only coast to coast race in Australia. Support events include a 32 kilometre walking race as well as team walking and running races. This is not just another run… be prepared to indulge in the truly unique King Island lifestyle, generous hospitality and incredible food. Entries are now open for the Numurkah Fun Run to held on Sunday 18th March. As part of this event there is a 5 km teams event which consists of 4 or more runners. It had been discussed that the Shepparton Runners Club should enter a 5 km team given the numbers that attended last year, so who’s keen? Entry forms can be found at the attached link. Need a running destination in 2018? Albury Wodonga could be the place. 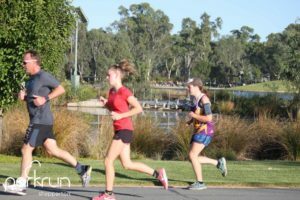 We’re happy to endorse Parklands Albury Wodonga’s portfolio of runs in Albury Wodonga this year- road, trail, flat, hilly, social, serious, there’s something for everyone. Our first run for the year, the Yarra Trail Run with distances of half marathon, 14km and 7km is coming up soon on Sunday 25 February. 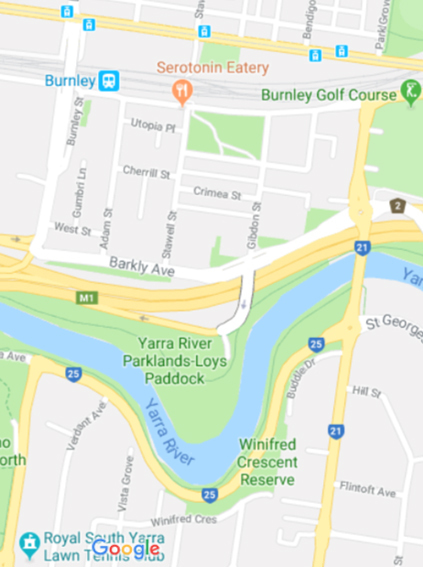 The race starts and finishes at Loys Paddock, Burnley on the Main Yarra Trail and follows the north and south sides of the river to create an amazing circuit of the river. The full circuit is 7km and could be described as “flat to undulating” with some short inclines and pontoon ramps that follow the contours of the riverbanks as they rise and fall. There are three race distances this year — 7km for runners and walkers, 14km and an added half marathon. There is a time cut-off to allow Parks Victoria access to the pontoon bridge at the Burnley Depot — runners must start their last lap by 10:00am. All three races start together at 8:00am. 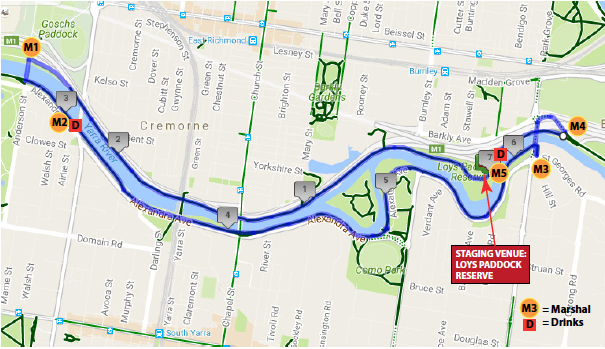 Access to the venue is via the Gibdon Street extension over the freeway bridge onto the Main Yarra Trail. Please do not attempt to drive into the venue — you will end up on the freeway! Parking is available a short walk away in the surrounding streets of Burnley and the venue is also accessible by train (Burnley Station), trams along Swan Street and by bicycle along the trail. Plenty of bike parking is available in the venue. Online entry closes 4:00pm Friday 23 February. Full details and earlybird online entry are available at this link. On the day entry is also available from 7:00am to 7:50am. The Williamstown Foreshore 5km, 10km and 15km run will be staged again in Newport Park adjacent to the athletics track . . . this year on Easter Monday 2 April. Williamstown is a wonderful part of Melbourne that is almost hidden away behind the West Gate Bridge. The views across the bay to the city skyline are just amazing — the run is staged on a 5km circuit in the linear park that follows the shoreline and The Strand. The race venue is located in Newport Park adjacent to the athletics track right at the mouth of the Yarra River. 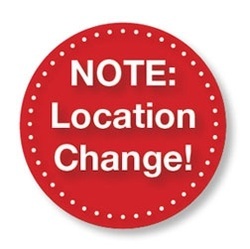 Races will have split starts, starting at 8:00am and there is plenty of parking in the designated parking bays adjacent to the athletics track and at the northern end of the Strand. Newport train station is about a 10-minute walk if you are using public transport. Full details and earlybird online entry are available here. We hope to see you soon at one of our up-coming races . . .
Two SRC members will be involved in the Queen’s Baton Relay. They are Allan Connerly and Kathy Fuller. Not to forget intermittent member Dhami Singh. 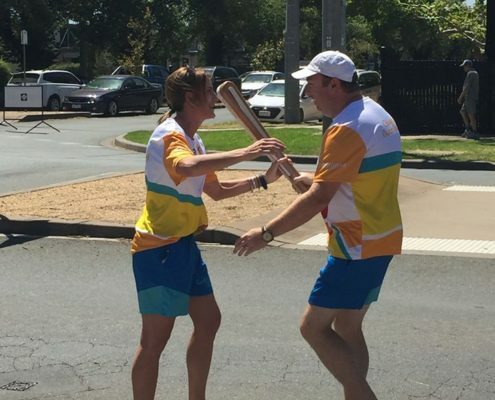 Share the Dream of the Queen’s Baton as it travels throughout Australia! 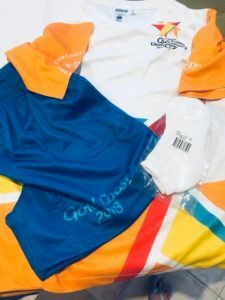 Come and share in the Queen’s Baton Relay, a Games tradition that celebrates the Commonwealth’s diversity, inspires community pride and excites people about the world-class festival of sports and culture to come! 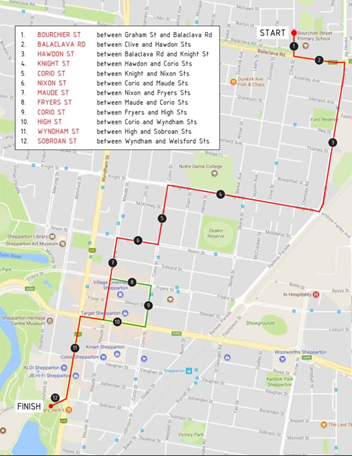 By Allan Connelly – My leg of carrying the baton is from approx 112 Knight st to approx 91 Corio st. Hope to see everyone there. It will be fun as well as an honour. Please be aware of these roads that will be CLOSED for approximately 30 minutes between 1:45pm and 3:15pm on Wednesday 14th February 2018 for the Queen’s Baton Relay. Runner Profile by Kate Dainton. PB’s 5km: 23:22 10km: 52:13 21km: 1:56:12 42km: forgot official time it wasn’t on Strava but it took along time! I started running as we had several close friends die within a 2 month period. I needed to get out of the house for some headspace so ran out the driveway and pretty much got hooked! I realised running made me more mindful, relaxed and energised. I’m hoping for half marathon in Wang, Gold Coast marathon, Bright fun run and open for suggestions! Maybe a beach trail! My goal is to get a better time! Sub 23 would give me a happy dance. I’ll be waiting for the kudos guys- lol. No seriously I just want to enjoy the journey and I’m loving how the family are getting involved at the club. It’s great seeing their massive smiles on their faces or seeing them overcome the mental game of running. The biggest obstacle was when all my equipment went missing before the marathon but it all worked out. I figured you just need to run!! You don’t need any gadgets, just your feet and positivity. I’ve had 2 break throughs.. Coach Chris paced me at park run and I took 1 minute off my pb. Shepparton running festival I took 8 minutes off 21km. Both were unexpected. I was shocked, stunned and I definitely did a happy dance. The runners who win at the SRC handicap, my 65 year old Mum who had a crack at her park run pb, the kids and the runners who are so patient recovering when injured. My fav place to run are trails. I’m happy to get lost in nature. Smart Recovery and training is my wisdom of advice ( I’m learning) I remind myself that no run is a bad run. It’s just a run and make sure you are balancing everything else in your life. Jeez I’m annoying!! But the more I thought about I realised… in the part most enjoyable run would be; run melbourne half marathon. I raised $3,500 with my brother to help find a cure for my step mums incurable cancer. Everyone was crying at the finish line. February 1600 mtrs handicap results at the Athletics track. Congratulations to Mason, Zac and Steve on their awesome performances this morning in the February Handicap event. Thanks also to the Sportsmans Warehouse Shepparton for supporting the event. 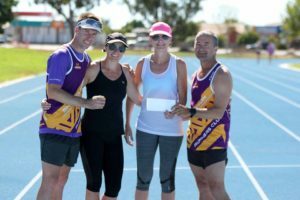 The Shepparton Runners Club also use the day to assist Kathy Fuller and Narell Pell in their quest to raise funds and awareness for child sexual abuse survivors . 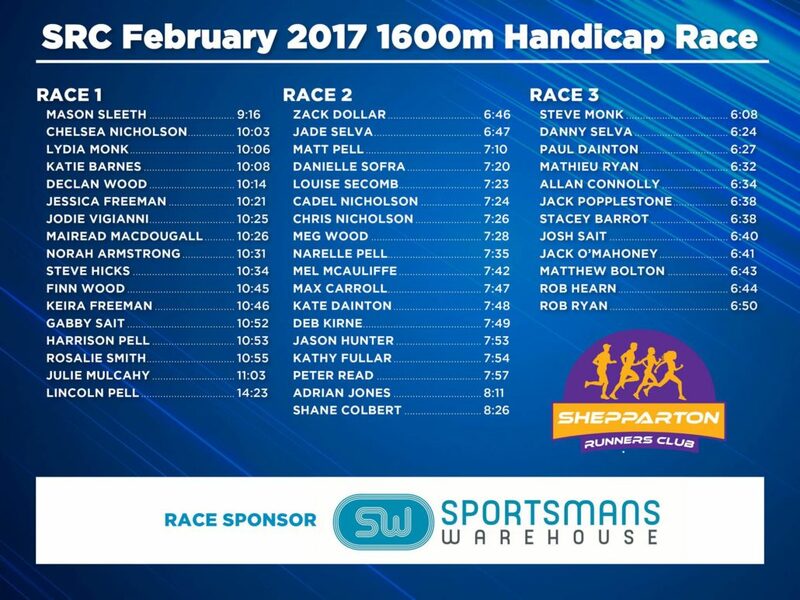 Congratulations to 47 runners who came along and ran in the February 1600m handicap. Massive thanks to Sportsmans Warehouse for donating the prizes as well as Chris and Norah Armstrong for running the event and working everyone’s handicaps. FULL results can be found on the link below. Lucy Bartholomew is an incredible athlete and a genuine, down to earth person. I’d recommend to everyone to follow her on Facebook, Strava, or Snapchat. Lucy wrote the following thought-provoking words on Facebook late last week. I love that in this world you can surround yourself with people from different walks of life, who have traveled so many different paths in their own shoes and then you can find all these people standing together on a start line, taking on the same journey and sharing one passion together at a race. BUT I have a problem with one word I hear way, way to often. “just’ . A few weeks ago I ran at the Two Bays Trail Run Page running event which hosts a 56km and a 28km option. My Dad and I took on the ultra in training for longer races and my brother the 28km. It was super cool to share this day with them both but when I had crossed the finish line and I was admittedly lying pretty dead on the pavement I heard my brother having a conversation with another runner. He asked if he ran the 56km, and my brother replied “no, I just ran the 28km”. There is no Just about it, it was a huge effort, I coached him into this effort and by simply using this word it undermines exactly what he achieved out there. Had I been able to stand up at that point I would have said something. Since that moment I have made a conscious effort to not use the word ‘just’ before saying what I did in the day or what I ran or what I aim to do. It is what I want, it is the best I can do and for me it is enough. I think its sad that we have to make it sound like you are making a short cut, taking the easier line or the weaker option. In 1 weeks I will run in the 62km of the Tarawera Ultramarathon. There is a 100 mile event, a 100km race, 80km and the 62km. I cant wait to play on this section of the course, to watch the other races result and to have my own challenge out there because no matter what distance you go out for, no matter what journey you chose to go on- there will be ups and there will be downs and to share this from 62km to 160km is a special thing without everyone needing to take all the same steps. The Ultra-Trail Australia is Australia’s version of the Ultra Trail du Mont Blanc – UTMB, there is the Pace Athletic 22km, 50km and the headlined 100km event. 2 years ago I ran the 22km after many, many ultra races and it still remains today as one the hardest runs I have done and the most painful I have pulled up. Last year I won and a set a new CR in the 100km but it wasn’t nearly as bad. My brother ran the 22km last year and will step to the 50km this year for his first ultra. I will be by his side making sure that he credits what he has achieved in such a small amount of time. I am so proud of what everyone dares to achieve out on the trails, there is no ‘just’ about it. Please don’t sell yourself short. Stand on that start line, stand on the finish line no matter how far you travelled, no matter the journey you took; the fact that you tried and you gave YOUR best. That should be enough for you and for anyone who is worthy to be in your company. This week’s podcast by Brady is bloody good. Put an hour aside and have a listen. Sarah’s mantra is, don’t judge people. She explains why in this excellent podcast. Tell me your tails podcast by Brady Threfall. This week I share a conversation I had with Sarah Walker. Sarah shares her story as someone who has recovered from anorexia 20 years ago. She nearly died as a 22 year old and while this is a life time ago the sharing of her personal experience is still very powerful and offers us, as listeners so much insight and learning. Cheers to Sarah for coming on. I hope you enjoy this one. Please read the general information page here. When you enter please enter under Shepparton Runners Club team. If you have any problems please contact the organisers. Here! The following is copied from the Wang Facebook page. 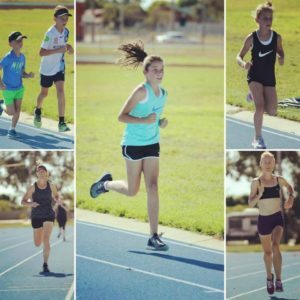 Not to be outdone by the Ferals, the Shepparton Runners Club are also once again looking to amass a big team for the 2018 Wangaratta Marathon & Fun Run (and walk!). The Shepparton Club has been 3rd, 4th and 5th in this competition in previous years and with growth in membership and a renewed vigor, they could get big numbers this year. all on traffic free riverside sealed pathways. If you want to be a pacer see Kathy Fuller. 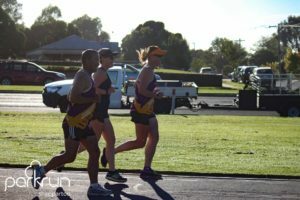 The Shepparton Runners Club provided pacers last year. Kathy has informed us that she would appreciate it again this year. Registrations for Mother’s Day Classic 2018 are now open! 1 in 8 Australian women will be diagnosed with breast cancer in their lifetime. 1 in 8 is more than a statistic – it’s a life. Numurkah Road Sports City entrace reopens today at 5pm. 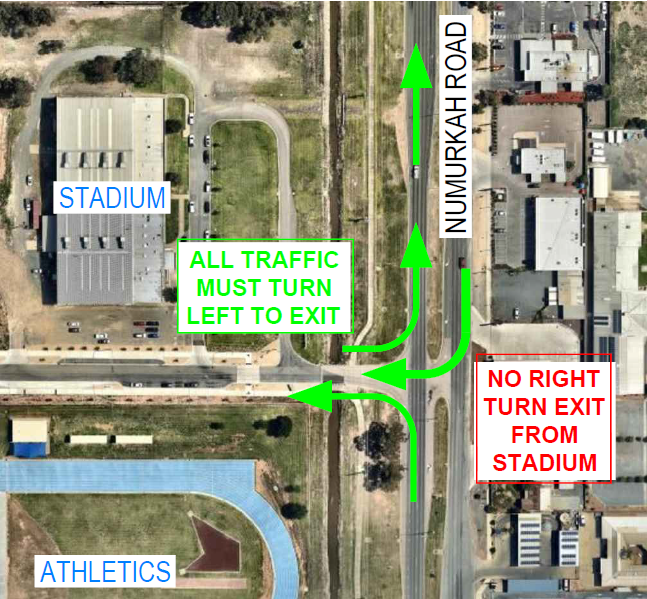 Local residents using Sports City will now have access into the area from Numurkah Road but will not be able to turn right when exiting Sports City onto Numurkah Road. Council advises drivers to use the Packham Street exit if they wish to travel south. A New Year, A New Goal and away we go! 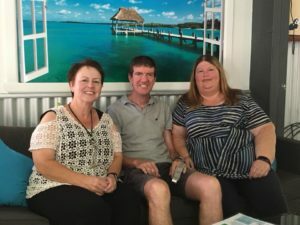 2018 Kathy Fuller & Narelle Pell have set the goal to complete 12 marathons in 12 months. In the quest to raise awareness and help prevent child sexual abuse. Together with community support from GV Health, GV Health Foundation and GV CASA, working together in partnership to reduce the statistics of 1 in 3 girls and 1 in 6 boys sexually abused by the age of 18 years. We would love your support. All fundraising money will be going to GVCASA (centre against sexual assault). The aim of the meeting is to let all members know where the club is standing at the moment and also a chance for the committee to get feedback from members. We look forward to seeing as many members there as possible. Also, we are asking that all runners make a donation ($5.00) on the day to GVCASA. As you know SRC member Kathy Fuller and Narelle Pell are running 12 marathons in 12 months to raise funds for GVCASA. Two Shepparton mums are planning to run 12 marathons in 12 months to support childhood victims of sexual abuse. Kathy Fuller and Narelle Pell aim to raise 100,000 dollars for G-V Health’s Centre Against Sexual Assault. An inspirational athlete or 2. 19 year old Meriem Daoui from Hobart could be one of Australia’s rising athletics stars in the next 5 years. She is a Muslim of Moroccan heritage, competes in full length clothes and a hijab, and is a type 1 diabetic. Neither her religion, her diabetes, or her running define Meriem Daoui. Her drive to make a positive impact on her community and her refusal to let anything stand in her way speak volumes about her. Find out more in this article at Tempo Journal. Taylor Little has cerebral palsy and needed someone else’s legs to get her through a marathon. 60 year old Peter Kline was looking for a challenge and pushed her in a large jogging stroller at the 2012 Las Vegas Marathon. Kline never returned to traditional racing and founded Marathons With Meaning, an organization that pairs runners and people with disabilities. Find out more in this article at the New York Times. Congratulations to all AUSTRALIAN DAY AWARD NOMINEES AND AWARD WINNERS. Sue has devoted most of her adult life to helping others and volunteering her time to multiple groups, including the SYC Hockey and Cricket Club, Sherbourne TOWN Club, Wilmot Road Primary School, Shepparton Agricultural Society, St John’s Ambulance Brigade, Cool Cat Rockers, the CWA and the Shepparton Show. She has devoted many years to these groups, and always finds time to help out when called upon. Sue is inspirational, nurturing and guides the students and juniors she comes in contact with, encouraging them to be the best they can be. Her kindness, dedication and commitment have benefited her community and family. 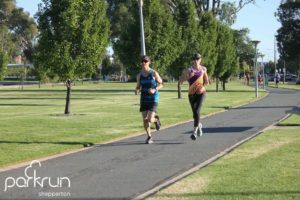 The Shepparton Parkrun commenced in 2014 and has held over 200 events weekly over its four years of operation. In that time, 2,500 different people have taken part and over 330 volunteers have donated their time to run the event. Parkrun is open to all members of the community, regardless of age, ability, or whether a walker or runner. The event allows participants to increase their health and fitness, as well as providing opportunities for social interaction and creating friendships. Nadine is an outstanding citizen and is highly involved in the equestrian and running fields. She has been involved in the Kyabram Pony Club as a riding member, instructor and parent for over 35 years. Nadine has competed across Victoria and interstate, with her specialty in eventing. 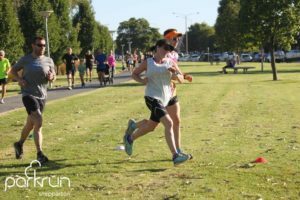 She is also a very keen runner, placing first in various categories at the Mitchelton Running Festival, and taking places in the Tatura Hospital Fun Run, Australian Corporate Games and Wangaratta Marathon. 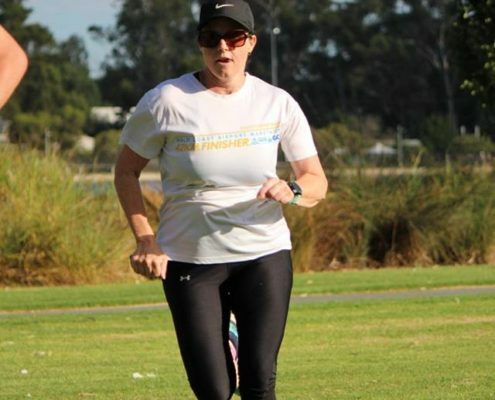 Nadine also volunteers at the Shepparton Parkrun, where she encourages all participating runners. Nadine is a great contributor, role model and is highly valued within her community. Look what we won! 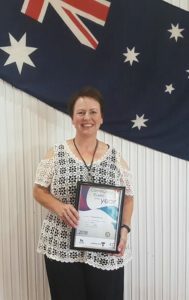 Cobram parkrun received the Community Event of the Year at the Moira Shire and Rotary Club of Cobram awards ceremoney just now!That means those of you that have run, walked, jogged or skipped our track, the scanners that have scanned, the time keepers that have got nervous about clicking the buttons, the token hander-outerers, the guys including Tom, that get out early and do our track safety check for our event and put signs out, the marshalls that smile and wave, the photographers that capture every grimace and grin, the parkdogs that barkrun, the amazing core team of Run Directors that bring the event to us each week and everyone else that does tasks like washing volunteer vests, downloading photos, processing results, replying to emails, to updating Facebook, writing our online newsletter – this award is for you! 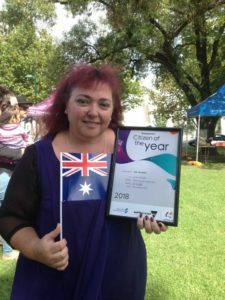 Thank you to everyone who nominated us in the Australia Day Albury Awards for Community Group of the Year and Volunteer of the Year. Whilst we missed out on the top honour to some well deserved recipients we are truly honoured to receive these nominations. Like everyone, we don’t do it for the awards, we do it because we love it. Launching parkrun almost four years ago has been one of the most rewarding things we have done and thank everyone for their support, week in and week out! A huge congratulations to all the parkruns around Australia that were nominated and won in these awards (far too many to mention), but in particular to our friends at Wangaratta parkrun Cobram parkrun and Shepparton parkrun its great to see the community recognising your contribution! I was never much of a runner in my youth. Field events were more my forte at school particularly anything that involved throwing something, discuss/javelin/shotput, I also played tennis/indoor cricket/mixed netball so I had my cardio covered. After Chel & I started a family time was a little short so I gave these things away. About 7 years ago I decided that I needed to get fit and try and prevent the “middle age spread” so I joined a gym and along with a fellow middle aged gym member took up running. Depends what I am training for, but a typical training week may consists of 2 speed/Interval sessions, 1-2 recovery runs, parkrun partnering Cadel, and a Sunday long run. To get over a hip/groin injury that I current have and regain the level of fitness that I had prior to it. 3 years ago I ruptured two of my discs in my lower back to the degree that an orthopaedic surgeon told me I had the lower back equivalent to that of an 80 year old and he was very surprised that I could actually walk let alone still run. He gave me the option of going under the knife or stop running for 6 months and see how I went. Surprisingly I did what a lot of other runners would not do and hung up the running shoes for 6 months and with the guidance of an excellent sports physio went about slowly building up my core and lower back strength. This injury, which will never fully repair itself, still hampers me from time to time. I’m a big believer in running below a certain heart rate on my recovery and long runs, a concept Chris Armstrong introduced to me last year. Prior to that I ran too many of my training runs at Race Pace, particularly my long runs. Not only has it improved my cardio fitness but it has made those long runs so much more enjoyable, thanks Chris! I enjoy parkrun whether it’s at Shepparton or elsewhere. 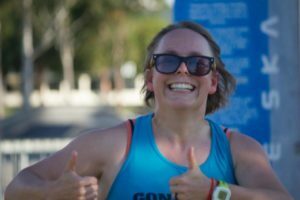 There is something special about the atmosphere surrounding parkrun that you don’t get at other runs, the spirit of comradery and inclusion is unique. I have had the added bonus of being able to run with Cadel for the last three years which by doing so constantly reminds me to “keep running fun”. Anyone who is out there “having a go” regardless of their size, pace or age. I love pacing people at parkrun and training for this reason as I get to encourage people to push themselves to a level that perhaps they didn’t think they could get to. Also my son Cadel inspires me to try harder. There is nothing like the constant threat of your 9 year old child getting faster than you to inspire you to run harder.